Then you move yourcue stick with aparallel shift over tothe CB and shot theCB right down thatline - just a nicestroke with a tip ofleft(right) english andthe speed about 20%above the average. 2 Cushion "Midpoint"Kick System(Opposite Squares -One Tip English)! Thesystem works whenthe CB and the OBare in the oppositesquares. 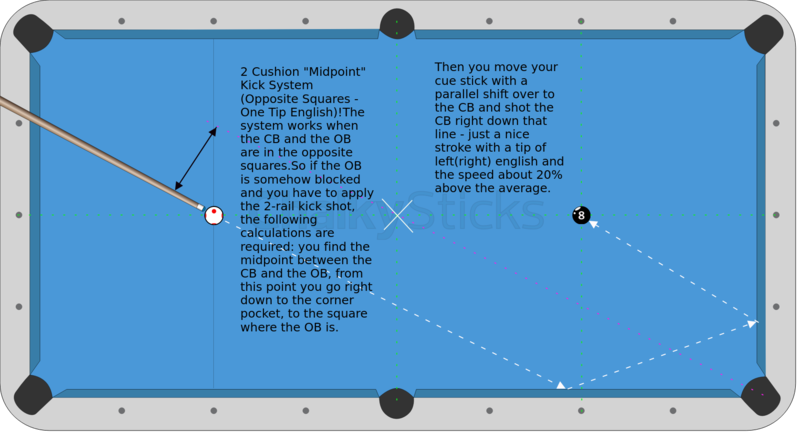 So if the OBis somehow blockedand you have to applythe 2-rail kick shot,the followingcalculations arerequired: you find themidpoint between theCB and the OB, fromthis point you go rightdown to the cornerpocket, to the squarewhere the OB is.